It is the mission of the Smithfield VA Events to bring well organized, first-class events to the Town of Smithfield and in doing so, support local non-profits, charities, civic groups and strengthen our community by benefiting tourism and local business. SVAE Board Members serve as Volunteers, dedicating many hours annually to ensure the mission of SVAE benefits our community. In December of 2010, around a table at Smithfield Station a group of folks, who had a vision for successful events in the Town of Smithfield, met and formed The Smithfield Wine & Brew Fest Committee. They joined forces with the Smithfield Rotary Club began making plans for the inaugural Smithfield Wine & Brew Fest. The new beautiful Windsor Castle Park, located walking distance from the Historic District, along the banks of the river and with the picturesque Manor House & Barns provided the Town a fabulous venue for outdoor events. Held in April 2012, the first year was a success our community was proud of! Hosted by The Smithfield Wine & Brew Committee and the Smithfield Rotary Club, and in partnership with sponsors and the support of multiple civic organizations, we were able to give $43,500 back to the community. A few other facts to note: total number of volunteers (132), sold-out crowd of 2000, lots of locals, 45% of crowd was from out-of-town, and (80) hotel nights were booked in Smithfield because of the festival. Tickets sales included all Coastal Virginia cities, Richmond, Charlottesville, Washington DC, Maryland, New Jersey, Pennsylvania, Ohio, North & South Carolina, Georgia and Florida! Local businesses hosted wine related dinners, events and special sales that provided additional experiences for attendees. During 2012-2013, the Smithfield Wine & Brew Fest made an investment in the festival grounds with the addition of the expanded Brew Village site. We increased chalets from (9) to (22) and added two additional entertainment stages. These changes proved to be a raving success for the 2600+ second-year participants. The event sold out nine days in advance. Over 58% of the crowd came from out of town, (114) hotel rooms were booked, and over (200) volunteers worked to make it all happen. We added eight VA Breweries and increased the number of VA Wineries. We were blessed with another year of awesome weather and were able to donate $48,000 to the local community. It is estimated that the direct local economic impact was about $340,000. We held our 3rd Smithfield Wine & Brew Fest, on April 12, 2014. We added (5) chalets more chalets, for a total of (27). Two of the new chalets were donated to local school systems to auction off at their gala fundraising events which brought over $5000 in revenue to their events, and the other three were added to our sponsorship program. The popular event sold out 2 ½ months in advance, taking all of us by surprise and many were disappointed because they could not get tickets. We are thrilled folks like our Fests, and we would love more to be able to come, but we are not willing to compromise the boutique integrity of our festivals. Again 2600+ folks attended, the weather was fabulous and we saw a 32% increase in hotel nights. We felt it was time to expand our offerings of events and in 2014 added two new events. 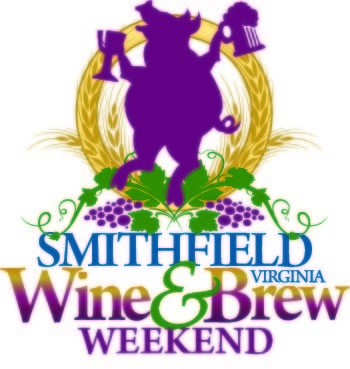 Instead of just a wine & brew fest committee, we transitioned into being Smithfield VA Events. Besides planning our own Fests, we also provide support for other events held in Smithfield and Isle of Wight County. 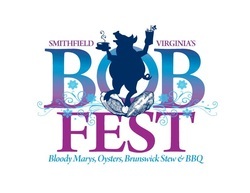 In January 2014, in conjunction with the Optimist Club of Isle of Wight, we held the first Smithfield VA BOB Fest & 8K Chilly BOB Roadrace. BOB = Bloody Mary’s, Oysters, BBQ & Brunswick Stew and they were all on the menu, along with entertainment by the fabulous 80's show band, THE DELOREANS. Oh, OH, OHH – it was all under a heated 10,000 sq. ft. party tent. There were 1000 attendees, 160 runners, and the event sold out over a week in advance. 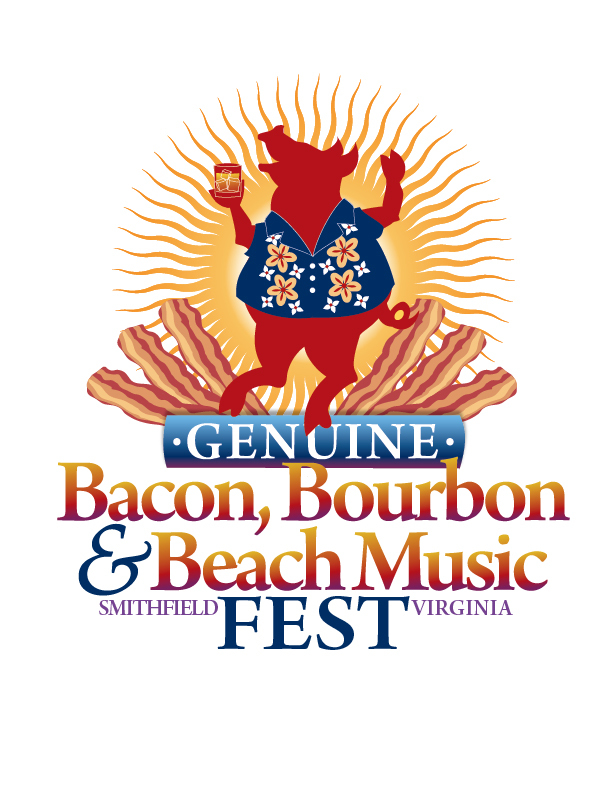 In Sept 2014, we held the first Genuine Smithfield Bacon, Bourbon & Beach Music Fest. Where better to have a Bacon Fest, than in the town that really knows Bacon? No tiny little munchies of weird bacon here…we are serving BIG BACON, Bourbon and VA Craft Brew Tastings, Fun Bacon Games, Wine & Great Other Food (besides bacon) & Beach Music. Moving forward, this trio of events has a little something for everyone! We currently have expanded both the Wine/Brew and Bacon/Bourbon to 3200 attendance and expanded the BOB Fest to more than 60,000 sq ft of heated tents that accommodate 220o folks. Tickets now sell out within a minute or two, we have two different release dates and our sponsorship program is lively. So, Mark your calendars, plan in advance to get tickets and consider becoming part of our VIP Premium/Sponsorship Program. Since April 2012, and thru the 2018 Wine & Brew Fest, SVAE has donated over $818,000 back into our community. We anticipate hitting the $1 Million Milestone in 2019! Please join our ENews list and stay up-to-date on event information. Our reputation for putting on well-planned, first-class boutique events has made our tickets some of the hottest and hardest to get in Coastal Virginia! Smithfield VA Events is a 501 (c) (3) public charity. All events are 21 & Up only. See each event's rules for specific details on each event.